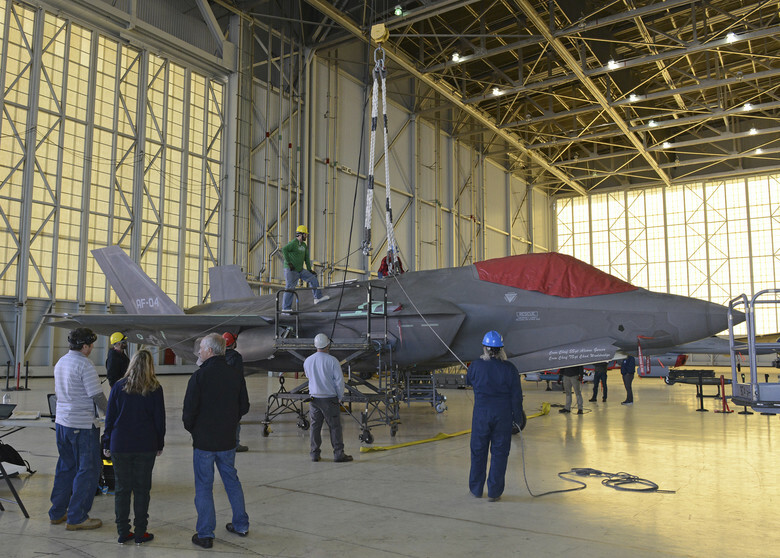 The 461st Flight Test Squadron’s F-35 aircraft AF-04 sits in Hangar 1600 as a test team verifies crash and disabled aircraft recovery procedures Dec. 12, 2018. 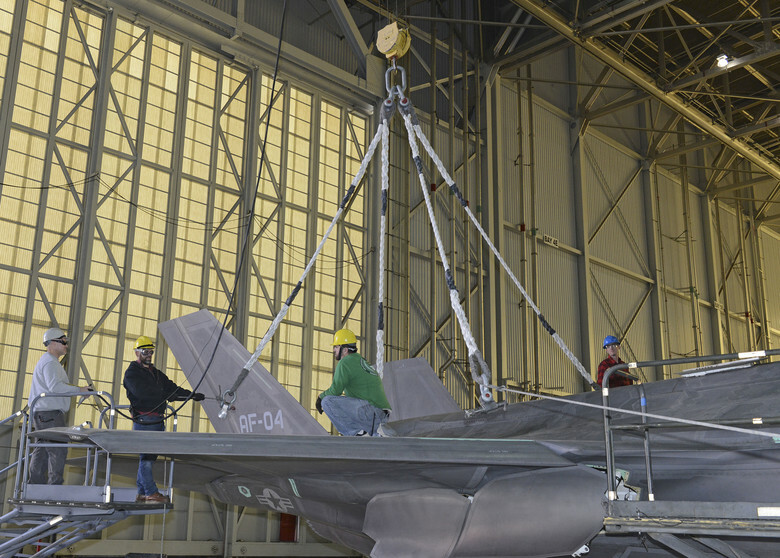 A strap that is placed underneath an F-35 and then attached to a crane is one of the methods a test team verified to recover a crashed or disabled F-35 Dec. 12, 2018. As explained in the USAF news release, the two-day event was to verify measures on the aircraft for what is referred to as crash, damage, disabled aircraft recovery, or CDDAR. Members from the 412th Maintenance Squadron (MXS) performed the actual procedures on the aircraft. 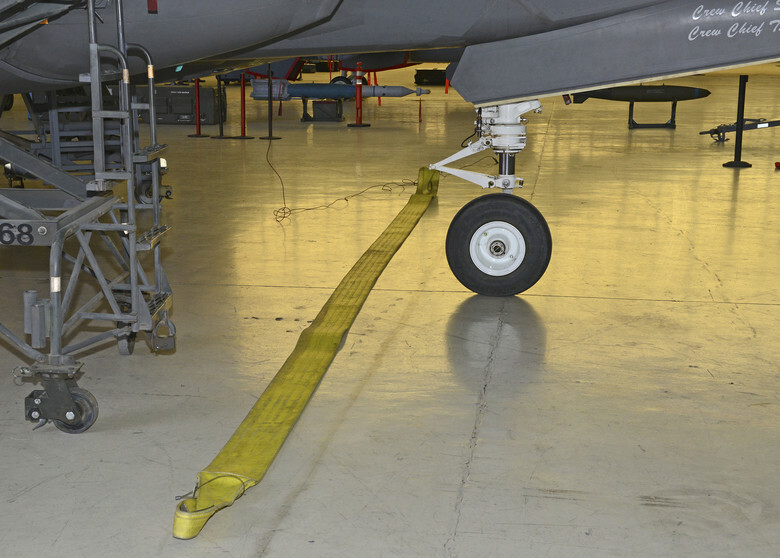 Different methods were verified such as using an aircraft sling attached to the F-35 to be lifted by a crane; “belly bands” that can be placed underneath the jet and attached to a crane; and inflatable airbags or lifting bags that can be used to raise a crashed or disabled F-35. Members of the 412th Maintenance Squadron attach an aircraft sling that connects to a crane to verify this method of recovering a crashed or disabled F-35 Lightning II during a two-day recovery procedures verification event Dec. 12, 2018. 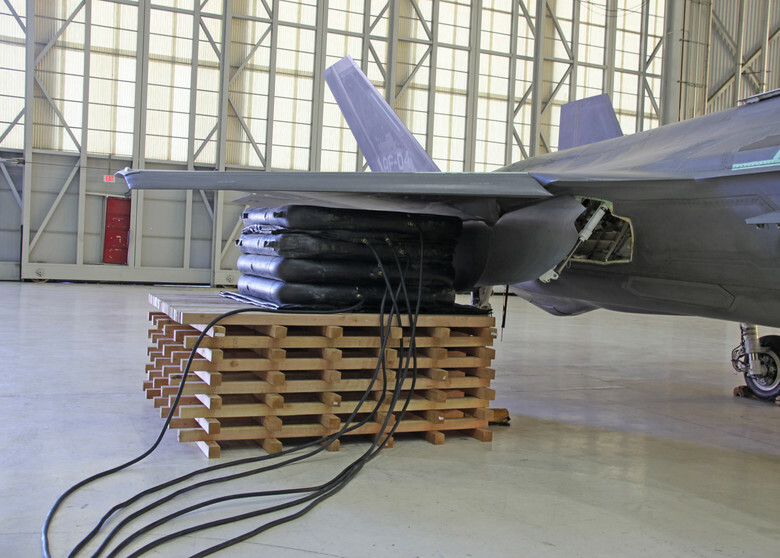 Airbags placed underneath an F-35 wing is one of the methods a test team verified to recover a crashed or disabled F-35 Dec. 12, 2018.